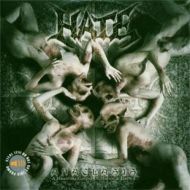 "Anaclasis: A Haunting Gospel of Malice & Hatred"
HATE has always been overshadowed by Polish brethren VADER, BEHEMOTH, and DECAPITATED, especially in the States. Some of that I would assume had to do with labels that lacked the promotion muscle of a Metal Blade, Century Media, or Earache. Signing to a hard-working label like France's Listenable and releasing "Awakening of the Liar" in 2003 helped get the word out, and now that "Anaclasis: A Haunting Gospel of Malice & Hatred" has been released even more folks should be discovering the band. As a side note, "The Litanies of Satan" DVD (Metal Mind Productions, 2004) offers a good overview of the band's music through live performances. Anyway, "Anaclasis…" is a worthy addition to Poland's already considerable death metal catalogue. The guttural vocals of main man Adam the First Sinner (guitars, synth, samples) are similar in many respects to the distinctive Polish roar of veterans like Peter Wiwczarek (VADER). However, the music on "Anaclasis…" is indicative of a band that has formed an identity. It is well structured, yet not overly technical, and sports a bit more melody and a cleaner guitar sound. The accessibility factor is closer to VADER than bands such as DECAPITATED or LOST SOUL. The industrial-laced synth work and samples heard throughout the disc are smartly incorporated into the arrangements, never detracting from the heaviness of the tunes. In fact, the machine-like coldness of these parts fits well with the band's style. Tight and chugging riffs that are anchored in groove and blasting drums are the common characteristics of the eight tracks that collectively add up to an easily digested 35 minutes. "Anaclasis", "Necropolis", "Malediction" feature chunky, precision riffs and a certain catchiness that melds superbly with the overall brutality. And I must say that the stuttering riff on "Hex" is…well…killer. It's nothing fancy, but it will put a snarl on your face. "Euphoria of the New Breed", "Razorblade" and "Immortality" are solid tracks as well, though not quite as strong as the first four cuts. The album ends with "Fountains of Blood to Reach Heavens", an almost seven-minute track that retains most of the blasting goodness of the previous songs, but incorporates a few more arrangement breaks. Melodic guitar parts during the song's latter half add spice to the dish before the song winds down with a synth part. Fans of any of the above-mentioned Polish bands, not to mention those seeking competently performed death metal with a slight twist should check out "Anaclasis…" What more can be said? The Poles have done it again!